Each time we’ve gone to a stamp show my wife and I first head to poster presentations to see what people have put together. Philatelists take a theme, or a bit of postage history and develop one to many panels that explore the concept in a mixture of text and stamp presentation. They can vary from very dry postal minutiae to stunning artistic displays, and all between. West’s work here is basically an expansion of that concept into book form. It doesn’t pretend to be an exhaustive history of Britain, not even of that small portion of Britain’s history that has coincided with stamp production. Instead it simply presents a series of special stamps to show how that stamp reflects a particular portion or key event between the start of Queen Victoria’s reign (and the first use of a stamp) until present day. The history related has both breadth and snippets of depth, covering aspects postal, social, political, and cultural. Reading this gives you insight into the aesthetics of stamp design – albeit Britain’s is a bit more tame and unadventurous compared to some other nations, and a well-balanced, though again, clearly and proudly British, insight into key events both within Britain and the world as a whole. 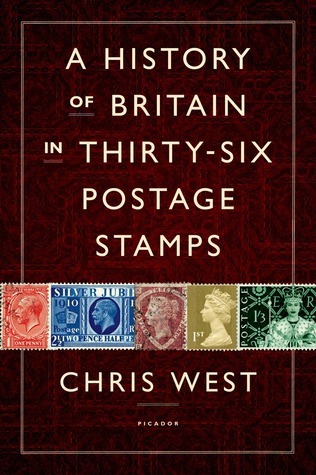 Well written and captivating for anyone that enjoys history or stamps, I’d recommend it. Personally I found the book to get better as it went along. Perhaps this is because I was more familiar with recent history than that of mid-late 1800s Britain. It may also be that the style and structure of the book, as little snippets of history, took some getting accustomed to. I have put this book on my wish list. Thanks for your review.